I cannot say if Orion have taken their influences from Lay's but they look very similar and are just as unimaginative.There is a giant logo and a few graphic Potato Chips plus the name of the flavour and in some cases, a graphic image of the main ingredient.White at the top, flavor color coding at the bottom. A row of Crinkle Cut Chips and a small picture of a plate with some coated drumsticks on with some lettuce and garlic. These were mostly whole and a little thinly cut Potato Chips. The narrow and shallow crinkles did not feature as much seasoning as expected. 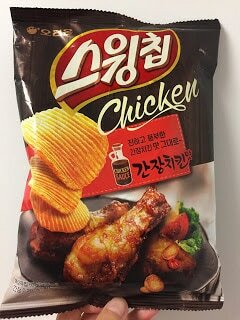 When we tested these we did not know what the flavor was supposed to be, so it was a little like blind tasting. They were sweet but familiar. When we learned the flavor it seemed quite obvious. They were not quite as nutty as expected, but mildly faithful, although very very sweet.